Michelia is one of the most popular flowering trees. It belongs to the Magnoliaceae family, the family of sub-tropical bushes and small trees; It is also one of the ancient families of the plant kingdom having existed since 95 million years. The flowers of Golden Champa are best known and used in India for several purposes. They are primarily used for worship at temples, floated in bowls of water to scent the room, as a fragrant decoration for bridal beds, for garlands, in religious ceremonies and generally worn in hair by women as a means of beauty ornament as well as a natural perfume. Golden Champa is a very useful agroforestry tree too! It is known to fix the atmospheric nitrogen in soil with the help of vesicular-arbuscular mycorrhizae. Its leaves provide very useful mulch. It improves the soil under tree cover by increasing pH, soil organic carbon and available phosphorus. Hence it is used to reforest badly eroded areas. Its leaves are used as larval fodder by silkworms & butterflies. Michelias are easy to grow and maintain. They love a lot of light and warmth but filtered sunlight. The best location for Michelia is the place where it receives direct and ample sunlight in early morning but partial light for the rest of the day. Suitable for containers, Michelias has shallow and brittle root system. It likes moderate watering in acidic and well-drained soil. As a general rule, water lavishly when the plant is young to allow it to develop good root system. Water mature trees moderately and feed with a general purpose fertilizer during spring. Prune in winter when plant goes dormant. Michelia can gain a height of 30 meters in suitable conditions. The tree bears large leaves that resemble the leaves of Mango tree. The tree booms from May to October and produces abundance of star-shaped flowers that fill the entire surrounding with mesmerizing scent. Flowers are usually golden-yellow, golden-orange and creamy-white. Michelia has several ornamental, commercial and medicinal uses too. For gardeners, it is an excellent choice as a houseplant or as companion plant in landscapes. Commercially, the timber of Michelia is used for almost anything from cabinet-making to firewood and flowers are grown to sell at cut flower shops. 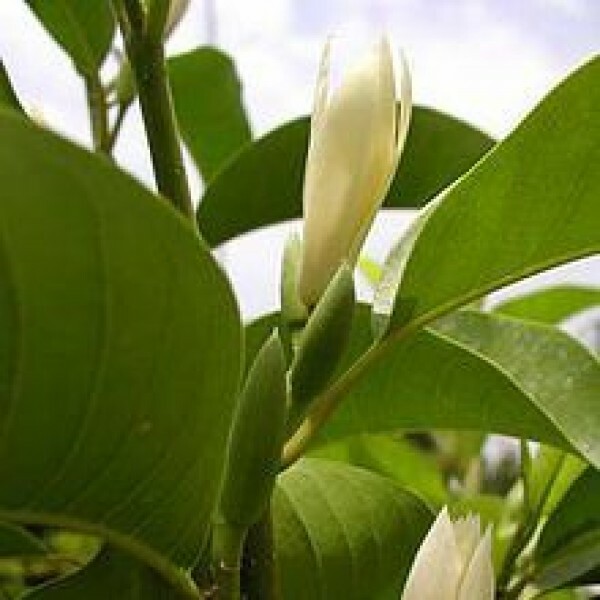 The extract from the flowers of Michelia Alba is used in preparation of the famous ‘Joy’ perfume. Medicinally, the tree has wide applications; the bark is used to prepare tonic, the oil extracted from flowers is used to cure toughs and rheumatism, and for relieving eye troubles and gout.